Women have a tendency to think Agriculture is a man’s field. The fact that women make up a quarter of students in university agriculture programs is evidence enough to support this myth. This is quite ironic considering during the opening ceremony, a number of keynote speakers including Mrs. Graca Machel stated that women make better agriculturalists. Little attention is given to the roles women play in agriculture let alone, their specific needs and priorities. The poor representation of women in higher education programs is due to some of the assumptions made about agriculture which include that it is ‘dirty’, ‘labor intensive’ and ‘not suitable for women’. This has contributed to the negative perceptions toward agriculture by women. Issues about girls dropping out of secondary school were also raised and the factors attributed to this include the social pressure to get married, girls not encouraged to take science subjects, lack of financial resources and career guidance. The main question asked during the session was: ‘How can girls be encouraged to join agricultural sciences?’. 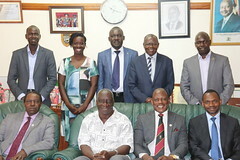 A number of solutions were discussed. Creating incentives like awards and scholarships for excelling students was found to be a key strategy in motivating girls to study sciences. The African Women in Agricultural Research for Development (AWARD) program that engages young women from about 11 African countries gives an opportunity for career development and mentorship for young women. It was also observed that at secondary school level, agriculture is too key to be an optional subject. It is high time educational institutions transition to making it a core subject so as to capture the attention of young women while they are young. The gaps in policy were also discussed such as lack of gender policies in universities and lack of investment in agriculture with the key issue being ‘how to integrate gender and research?’. Women in agriculture as the faces of success were called on to form agents for change alliances to help influence policies and networks of advisors to guide fellow women and girls. The session organized by innovATE and Virginia Tech was a platform for addressing important gender issues concerning women in the agricultural sciences with the hope of finding ways to encourage girls and women to join.